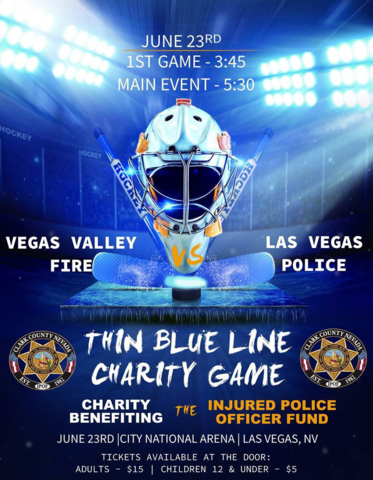 Las Vegas police squared off against valley firefighters in a charity hockey game at City National Arena on June 23. The first round of the "Thin Blue Blue Line Charity Game" kicked off at 3:45 p.m. followed by the Main Event at 5:30 p.m. Some of the Vegas Golden Knights players showed up to watch the game. Knights forward Alex Tuch dropped the puck at the start of the match, and defenseman Deryk Engelland actually played in the game. Proceeds from the event benefited the Injured Police Officer Fund, which helps law enforcement officials who are hurt in the line of duty. The money was donated in honor of Officer Charleston Hartfield, who was killed during the 1 October shooting in Las Vegas.